AgencyWeb CourtNotify is a web-based subpoena management system that automates subpoena issuance and receipt for law enforcement and civilian witnesses. It can be used independently by law enforcement agencies or integrated with judicial case management systems to provide an end-to-end solution for courts, prosecutors, public defenders and public safety agencies. Notifications include real-time acknowledgments that can be view by the courts and law enforcement agencies. When court attendance tracking is included, it provides a complete end-to-end solution that streamlines processes and reduces cost..
"Katrina has shown how timely, accurate and shared information is critical to the operations of every criminal justice agency in New Orleans. Post-Katrina manpower shortages made labor saving efficiencies like CourtNotify, even more important." 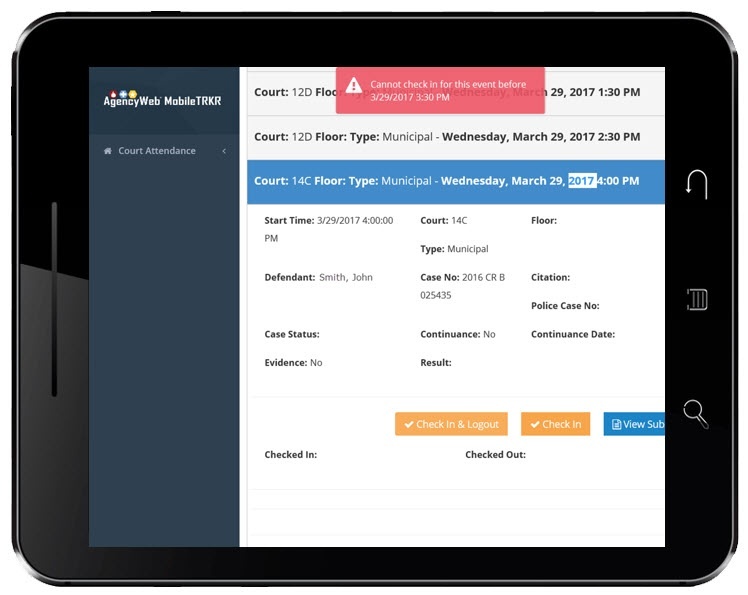 CourtNotify is used to add witnesses to case events and send electronic subpoena notices to officers and civilian service deputies. It includes the ability to view officer's schedule, track acknowledgments and add notes. As new court case events are added, witness details are automatically included throughout the case’s life-cycle. Witness receipt confirmations are name, time and date stamped for auditing purposes. CourtNotify is used by law enforcement agencies to receive and acknowledge officer subpoenas electronically. Case details include defendant and co-defendant details, charges and court information. Court events are synced with each officer's schedule. Any scheduling conflicts are red flagged. Automatic email reminders are sent to officers that fail to confirm their notification receipt after agency-defined time periods. CourtNotify is used by agencies responsible for serving civilian subpoenas throughout their communities. Serving agencies can scan paper subpoenas or data enter witness and case details. Authorized personnel assign deliveries electronically to service deputies. Laptop or handheld devices are used to verify addresses and enter delivery results. Delivery statuses are viewed in real-time. Define the perimeter your agency would like to establish around Courthouses for officers using AgencyWeb Mobile. Once the geofence feature is engaged, their arrival and departure times will be automatically captured and saved for analytical purposes. 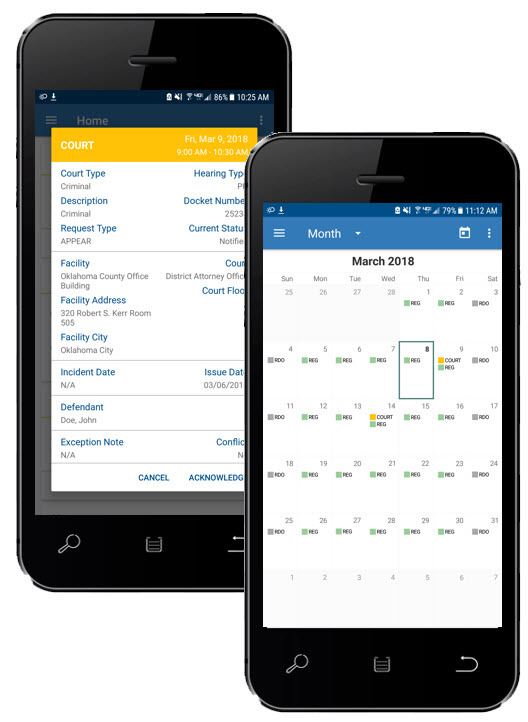 Orion's MobileTRKR can be used on any type of web-based device located at the Courthouse to capture officer attendance and case result details. Rules can be applied to ensure that officers do not check into events too early or remaining too long after their court events have concluded. Court liaisons can send real-time alerts regarding court changes or canceled events. Officers can acknowledge receipt of their notifications while on the go using SMS text message or the AgencyWeb Mobile app. 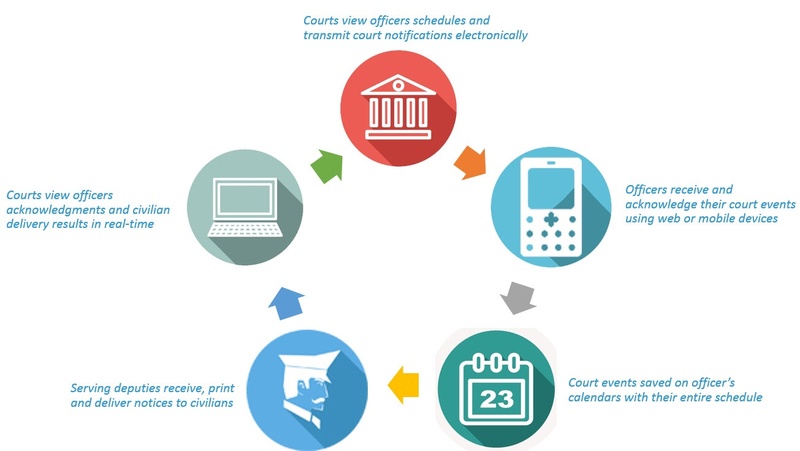 All court events are automatically displayed on officer calendars and department rosters.